We have been getting some compliments on our design here at Blogging Pro, and a few e-mails asking where they can get our theme. I have been wanting us to release a WordPress theme for a while now, and so I present to you this design, Blogging Pro’s Theme as a free to download theme. We ask only that you keep the attribution links in the footer, and link to this post, rather than directly to the zip files, when spreading the word about this and other themes we will be providing on Blogging Pro. This three column theme is WordPress 2.1 ready and should work just fine in WordPress 2.0.x. It has been tested on a variety of browsers, but we can’t promise that there will be no problems. It comes in two versions, one with the big footer like Blogging Pro, that gives information on recent posts, recent comments and most commented stories, and one without the big footer, and thus no need for any plugins at all. For the plugin required version, we have included a separate zip file that contains the three plugins needed. All three are from the talented Nick Momrik of MtDewVirus and we always recommend you get the latest version from the plugin author. Note: If you already have Nick’s Most Commented, Recent Comments and Recent Posts plugins, you will most likely not need the plugins.zip file. So the Blogging Pro Theme has been circulating for a while now, and has even been transformed into a Textpattern theme, but has anyone gone beyond uploading and activating it? Yes, and we have some examples for you. Adding in their own header graphic as well as changing the colors around is Caracasapie. Another shift in colors and header area is CwickCrown. I love the gray shift. The most popular shift seems to be towards green, and I have three examples of that. 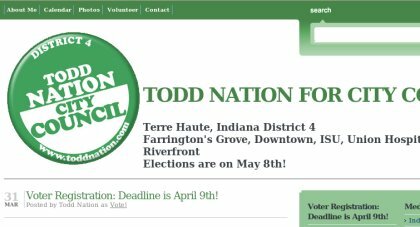 The first example is from ToddNation.com. The second is from TalkNewMedia. Both use very different greens, but both look absolutely great, but the third example is something completely different, and at first I didn’t even recognize it as using the Blogging Pro theme and that would be the Expression blog. Last but not least is my favorite shift in colors for the Blogging Pro theme. It basically flips our colors around in a one-eighty, and you come up with the blog for The Situation. I am looking forward to seeing more modifications to the Blogging Pro theme, and if you have created a major color or design shift using the Blogging Pro theme as a basis, please let us know. Also, if you liked the Blogging Pro theme, you are going to love what we have for you coming out tomorrow. So, as I hope you can all see, Blogging Pro has received a design refresh. After launching our Blogging Pro theme a long time ago as a free to download theme, it seemed only wise to differentiate ourselves from those using that theme. If you are reading this site via a feed reader, it is time to come over and check out the new design. I have been having some issues with the new theme that I am working on fixing, but they seem to be ingrained into WordPress, and so might take me a little while to rectify. Other than one or two small issues, I am very impressed with both the design and implementation of this WordPress theme. Designed by James McDonald, the same person that did my site Branding David, James has done an amazing job with the revamp of Blogging Pro. I am excited to hear what you think of this new design, and going forward, I hope you enjoy the refresh as well. I will talk about the coding process in an upcoming post. Sidenote/Update: A huge thanks to Sivel in the WordPress IRC chat for helping me through a strange problem I was having.